Rachel is an experienced Registered Nutritional Therapist, Functional Medicine Health Coach and Autoimmune Paleo Health coach. 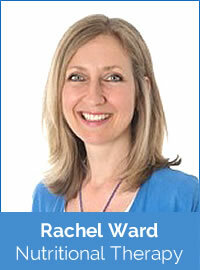 Rachel is passionate about the healing power of food and uses nutritional therapy, lifestyle interventions and coaching to offer an individualised approach to help people to achieve their health goals and feel as well as they can. She uses a Functional Medicine approach, which aims to identify the underlying causes of illness or symptoms and recognises that each person is biochemically unique and has differing requirements to meet their health goals. Rachel offers advice on a broad range of health issues, including energy regulation, Chronic Fatigue Syndrome, digestive health, thyroid health and autoimmunity, gluten-related disorders, stress and anxiety management and teenage health. She also has a special interest in food sensitivities and the impact of food and diet on mood, behaviour and energy. With first hand experience of implementing specific diets to assist with health problems having herself recovered from Chronic Fatigue Syndrome, Rachel gives practical advice and ideas to help make improving your health easy, achievable and stress-free. Rachel has been practising as Registered Nutritional Therapist for eight years having qualified from the acclaimed Institute for Optimum Nutrition, where she now works as a Clinic Tutor. *As a member of the British Association for Applied Nutrition and Nutritional Therapy, BANT, Rachel adheres to the strict code of conduct of the Association, which is that of the CNHC. The aim of Rachel’s practice is to attain the highest standards of integrity, knowledge, competence and professionalism in the practice of Nutritional Therapy.